Alage is a primitive chlorophyll-containing mainly aquatic eukaryotic organisms that lack true stems and roots and leaves. Algae is considered to be one of the most efficient organisms on earth, because of their rapid growth rate (some species can double their biomass in a day). Algae grows best in seawater, which comes in virtually unlimited supply. The growing needs of Algae are very different from biofuel crops which have been blamed for land grabbing in 3rd world countries and rising food prices. 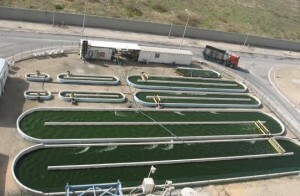 There are two main ways in which Algae is produced in a large scale. 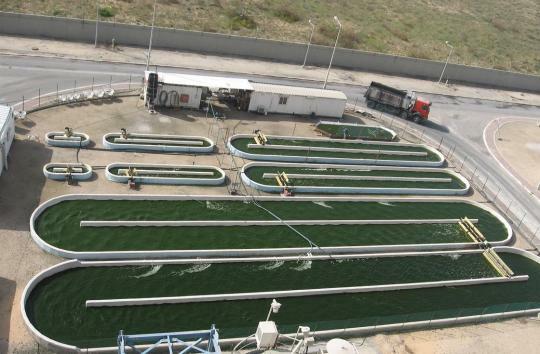 Algae can be harvested using a device called photobioreactors, this is also known as a PBR. The PBD is a self contained system with a controllable environment. It allows the the supply of light, nutrients, carbon dioxide, air, and temperature can be regulated. Using a PBR ncan prevent or at least minimise contamination (from other algae species and bugs), and allows easier cultivation of one algae strain. It also offers better control over a range of other growing conditions. In addititon to this a, closed system such as the PBR reduces evaporative water losses, and has lower carbon dioxide losses which all-in-all means higher cell concentrations. In other words there are more grams of algae produced per litre of water. Open ponds are natural waters (lakes, lagoons, ponds),artificial ponds or containers. The most commonly used Open Pond systems include shallow big ponds, tanks, circular ponds and raceway ponds. One of the major advantages of open ponds is that they are easier to construct and operate than most closed systems. However, major limitations in open ponds include poor light utilization by the cells, evaporative losses, diffusion of CO2 to the atmosphere, contamination and requirement of large areas of land. How is Algae turned into Biofuel? The algae oil content is most commly extracted using centrifuges. Algae can also be harvested using microscreens, by flocculation and by froth flotation. Algae must first be separated from its medium most common using crushing. Once the oil has been extracted the Biodiesel and glycerine must be separated , and any leftover reactants removed. The process is the same as the production of biodiesel and is called transesterification. For more information on this process see the Making Biodiesel page. The US the Department of Energy is investing hundreds of millions of research dollars into the production of Biofuel from Algae. When used for the production of Biofuel, Algae is often classed as a so-called third-generation biofuel. It is processed in very much the same way as biofuel crops and relys on its high oil and biomass content. Algae produces upto 300 times more oil per acre than conventional food crops, such as palms, grapeseed, soybeans, or jatropha. 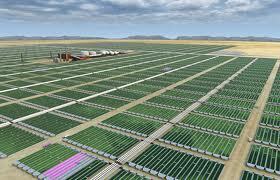 Algae has a harvesting cycle of 1–10 days, it allows several harvests in a very short time-frame, a differing strategy to yearly crops. Algae can grow 20 to 30 times faster than food crops. Algae can be grown on land that is not suitable for other established crops, for example arid land, land with excessively saline soil or drought-stricken land. Can I grown algae for Biofuel at home? Take a container and add a small amount of algae culture. If your plans for growing algae are towards producing biodiesel feedstock, you will need to find specific algae strains. Adding an aquarium bubble stone increases growth and circulates the algae. The only requirements for this type of system are CO2, (ambient CO2 is sufficient, though you’re growth rate will be slower), nutrients, such as fertilizer or manure, and a light source. The optimal temperature range will depend on the strain you are using.